B3Cat is a 1968 Cougar XR-7 GT. While this was the ultimate Cougar in 1967, by 1968 Mercury had introduced two more upscale specialty models, the XR-7G and the GT-E. 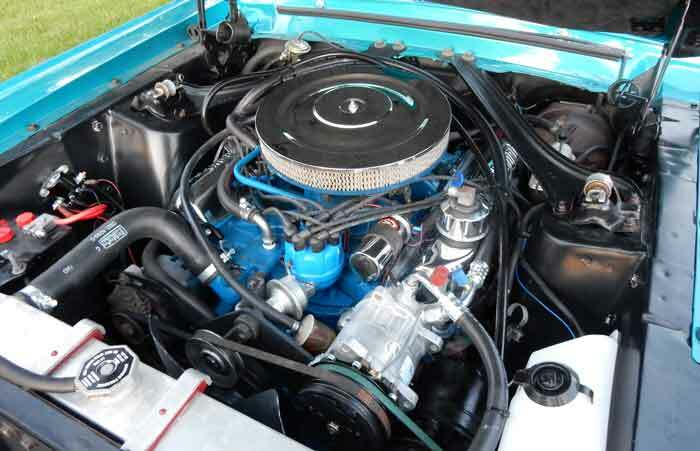 The XR-7G was available with all of the Cougar engine options while the GT-E was introduced with only one engine available – the W-code 427 side-oiler – and it was unique to the GT-E. Eventually, the R-Code 428CJ replaced the 427 in the GT-E and was available as an option for all other Cougars. Either way, the GT-E was the rarest Cougar produced in 1968 with only 394 produced. The XR-7G was a special trim and performance package with special badging and a unique interior based on the XR-7 package. There were originally 192 Cougars built in this Madras Blue and Parchment combination, but B3Cat is not one of them. However, once we saw the combination, we liked it so much we decided to apply it to B3Cat as well. So with 1,845 XR-7 GT’s produced in 1968, B3Cat cannot claim to be either particularly rare or the baddest of the ’68 Cougars but it is still more than capable of showing its claws. 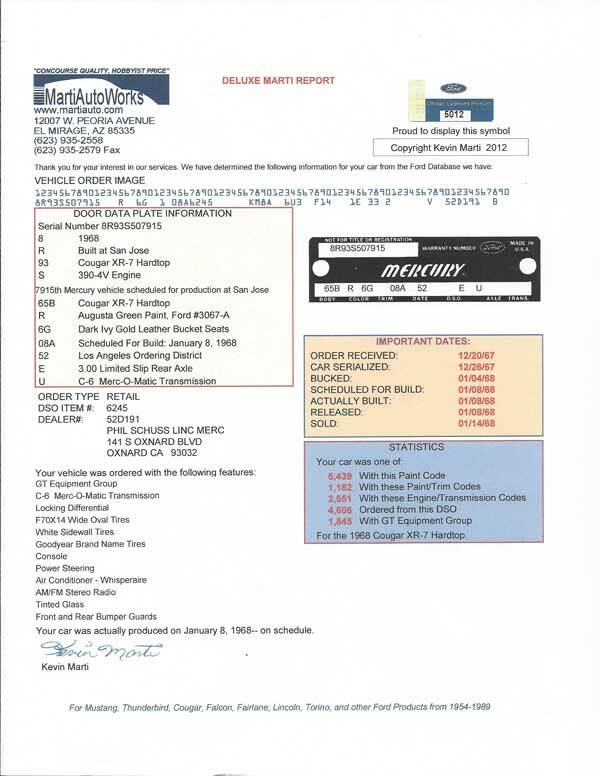 The GT package was based on the S-code 390-4V, just as it was in 1967, and got the same upgrades as part of the package. The only difference, as far as I know, between the two years is that the Kelsey-Hayes disc brakes were 1967 only, although the 1968 did get disc brakes as part of the package. The pictures below show B3Cat as it looks now with the restoration completed. Originally a San Jose car, so it was a perfect starting point for a restoration – a rust-free California car. Still, the body was pretty straight and there was very little rust repair needed – just a couple of patches in front of the rear wheels. Madras Blue is an Aqua color that sometimes shows blue/green and other times appears medium blue, depending on the light. The picture above shows the XR-7G exhaust treatment with the valence cut-outs and pipe-within-a-pipe exhaust tips. 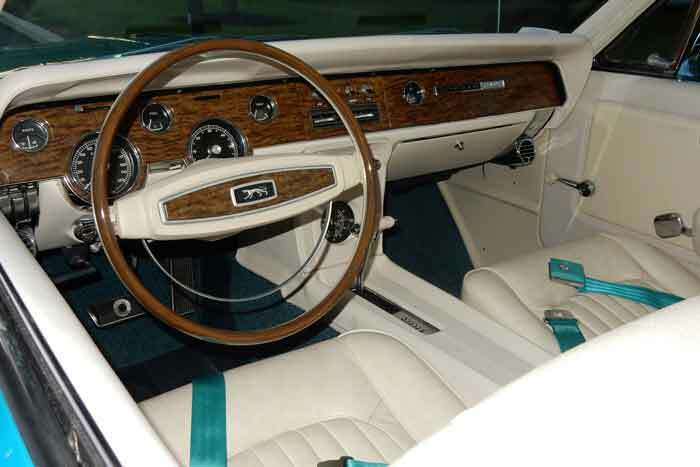 Below, the interior shows some of the custom touches, such as the chrome trim rings around the instruments (normally satin black), the parchment dash pad, and the aqua seat belts to match the exterior paint. The door panels had to be custom made since they are not reproduced, but they are very close to factory panels. 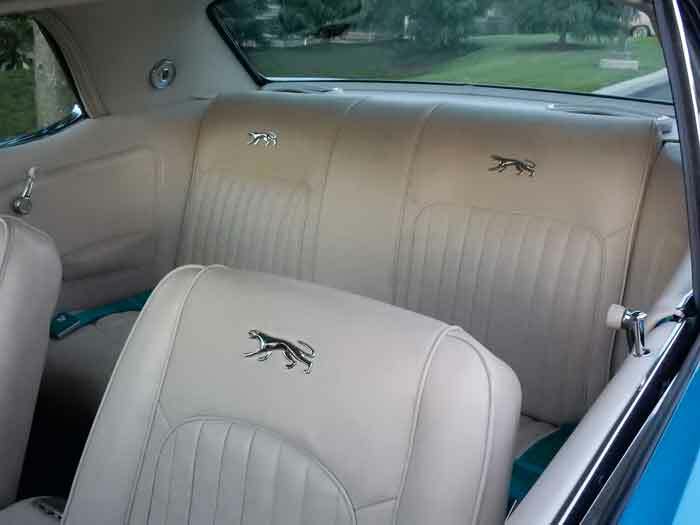 Another custom touch were the walking cats (normally used in the headlight cover corral) pinned to the seat backs. The engine was removed from the car and detailed, as was the engine compartment. A Classic Auto Air complete system replaced all the stock components that were removed from the car long before it got to us. Unfortunately, the previous owner who removed them didn’t think to keep them with the car, so it just made sense to buy an aftermarket system at that point. The restoration of this Cougar took 5 months to do, with Dave Croteau of DC Auto Restoration handling the body and paint along with some of the interior while Seamless Custom of Leicester, MA handled the upholstery and vinyl top.